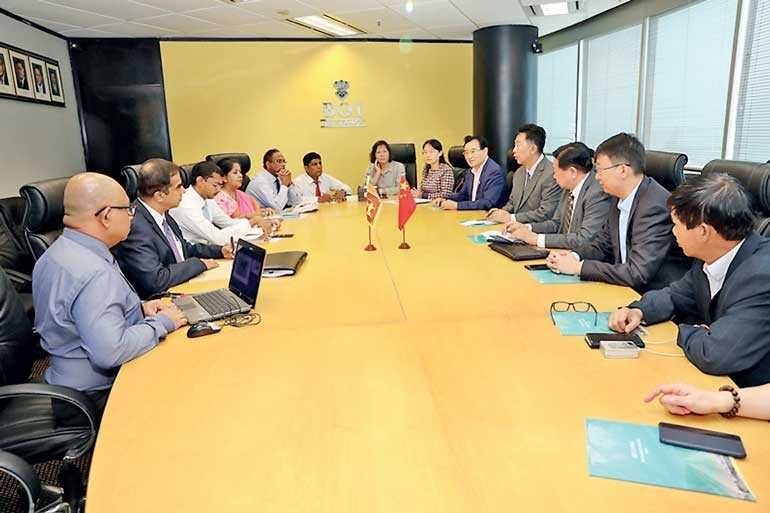 A delegation of 14 entrepreneurs from one of China’s leading business chambers, the China International Chamber of Commerce for the Private Sector (CICCPS), visited the BOI with a view of exploring possibilities of investment in the island. CICCPS is one of China’s leading chambers with a membership of over four million companies. This membership includes some of China’s mega enterprises such as Alibaba, Lenovo and Huawei. This was the delegation’s first visit to Sri Lanka. The BOI conducted a presentation in Chinese which focused on the strong relations that exist between Sri Lanka and China and particularly on Sri Lanka’s central location in China’s One Belt One Road strategic initiative. Sri Lanka’s ancient relations with China and postwar relations after the establishment of the People Republic of China in 1948 have now been taken to a new level with China’s emergence as the world’s second largest economy. The presentation also focused on Sri Lanka’s connection to the region through Free Trade Agreements with India and Pakistan, making it an ideal base for Chinese enterprises to access South Asia. Furthermore, Sri Lanka has also entered into a Free Trade Agreement with Singapore and benefits with the return of the European Union’s GSP+ facility. All these factors can serve as an incentive for Chinese private sector enterprises to invest in Sri Lanka. The BOI was represented by Prasanjith Wijayatilake - Executive Director, Investment Promotion; Nilupul De Silva – Director, Investment Promotion; Dilip S Samarasinghe – Director, Media and Publicity; Vipula Jayasinghe - Sector Head, China; and Manilal Ranasinghe – Deputy Director, Investment Promotion. Ajith D. Perera - Secretary and CEO of the Federation of Chambers of Commerce of Sri Lanka (FCCISL) said that the two chambers were represented at the Sri Lanka-China Investor Forum held in Chengdu, China. A decision was also made to open an APTA-SAARC Chamber of Commerce and Industry headquarters in Beijing. Sri Lanka, South Korea, Mongolia, India and China are members of this organisation. A special bond between FCCISL and CICCPS has made this possible. It is now possible for Sri Lanka’s major projects to be promoted in China through CICCPS. Perera also added that the delegation would shortly be visiting Hambantota. He added: “It is correct that China and Sri Lanka have a long-term friendship and the two governments have shown solidarity for future cooperation. Sri Lanka is a country which enjoys an excellent image in China and the people know of the friendship between Madam Sirimavo Bandaranaike and the late Chairman Mao Zedong and Premier Zhou Enlai. There is also a lot of friendship and a willingness on the part of the two countries to help each other when they face adversity. For example when Sri Lanka was affected by the Tsunami, China rushed to help her friend at that difficult time. At the same time when China suffered from a serious earthquake the people of China were touched by the assistance accorded by Sri Lanka. “China’s economy has been opened to the world for 40 years. And the result is a highly diversified industrial base which can offer Sri Lanka considerable technology and products. This delegation consists mainly of private sector companies and this is especially significant as private companies in China now surpass State enterprises. In the period from 2005-2017 China emerged as the single largest FDI generating country for Sri Lanka with a cumulative $ 1.738 billion.